Another question though, is DSP supported by vgmstream or in_cube? 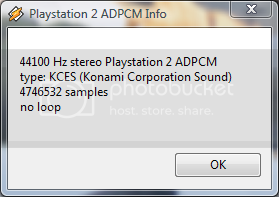 Because (Mario Kart again) the DSP files in that game do not work in test.exe or winamp. Those "DSP" files are actually the sound portion ripped from THP video. They are a somewhat different format and are not yet supported. Sorry to bring this up again, but vgmstream in its current state still cannot play these DDR SuperNOVA .vig files. It also cannot play them when I convert the files to .vag or .vig. The reason they were working before is because I had in_cube installed. When I deleted in_cube, the files wouldn't play at all. I removed in_vgmstream and tried it with just in_cube and they seem to work perfectly. I can upload an original .vig file if you want to have a look. Where would be the best place to upload it? Just one thing, if they work in in_cube, then that is ok for now isnt it? Just rename in_cube.dll to in_zube.dll, so that in_vgastream will take priority over it for other audio files. Also make sure you have the 3 things that are in the readme.txt, they help certain formats in VGAstream. For example I have multi files, and these didn't play until I had those files. in_cube's extension recognition wasn't very precise, so a number of other PS ADPCM formats might have actually played it, besides the actual VAG parser. When you play them with in_cube, what does Winamp the winamp info box ("View file info...") say under "type"? latest build, should work for ya.